Our next Soaring Eagle recipient is someone who has truly embodied our District Values and just recently retired as an educator here at SCS. The message tonight is from a student that wrote this about , Mr. Wiersma. “He was the most caring teacher I had in high school. He was friendly, understanding, and really challenged me to grow as a student and a person. He taught not only biology and anatomy to me, but he taught the value of loving other people and being a decent human being. He was inspiring and so funny. He made class more than just a beneficial learning experience. He ended most classes with an inspirational quote to take with you throughout the rest of your day. He is a very humble man, and I believe that is the best kind of leader. He provided me with academic challenges everyday, and challenges his students to become great citizens, friends, and people. He was quick to help students in need and was always willing to spend time with students. He cares on a genuine level, and that is the best service a teacher can provide. I may have forgotten the bones in my foot, but I will never forget the impact Mr. Wiersma had on me academically and personally. He is incredible. 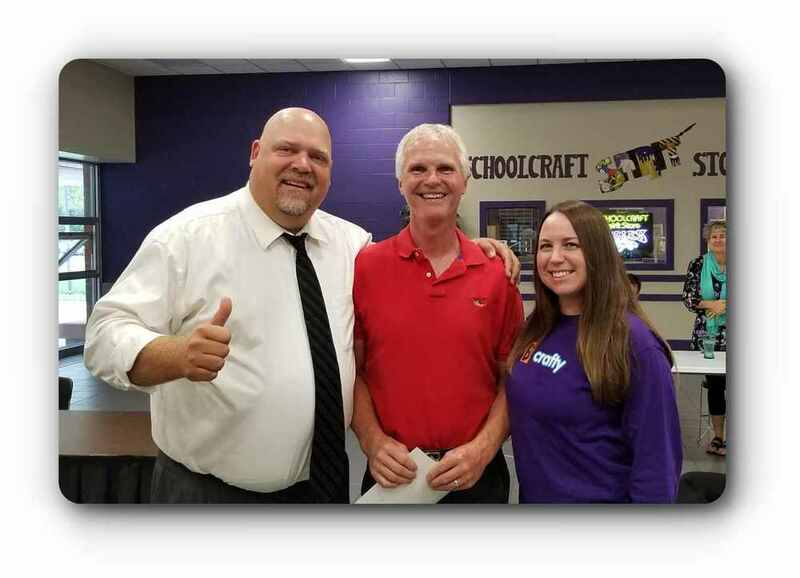 Please join me in thanking Mr. Wiersma for be such an impactful teacher to thousands of children here in Schoolcraft. He truly is a Soaring Eagle.